The 4.8 (4800) is a highly capable engine, great for mid size engine compartments and is considerably smaller than the 6.0. The 4.8 and the 5.3 share the same block but the internals; crank, rods, are not. The intake is taught and ready for climbing. A taller plenum design / tunnel ram effect, allows the air to hit the intake ports, yielding efficient power, with a snap of torque. 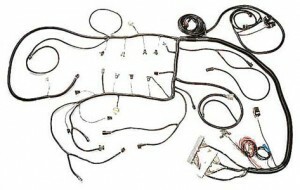 Speed Scene Wiring fabricates this fuel injected wire harness, with emissions or without. If you require this engine to run in a Marine environment, we can accommodate with the correct computer program. The nice thing about running a SSW wire harness and GM electronics are, diagnostics. If you decide to roll with the smaller ECM / VCM / PCM (These are neat names for computers.) You will lack the diagnostic capability. Bore and (X) stroke is 96.01 X 83.00mm, with a stationary 2 valves per cylinder. & GMC Yukon, GMC Savana. The Torque is rated at 290 ft-lb@4000 RPM. For all models. No doubt, all Sliverado, GMC Sierra (2500/3500 Series) have 275 ft-lb of Torque @ 5200.